The East Coast of the US with it's many bays, from Maine to Florida, is a rich cruising ground for both US and foreign cruisers. We have chosen to provide information only about the Chesapeake Bay and Annapolis since it has been more than 9 years since we have cruised outside of this area. Thousands cruise the US East Coast from Maine to Florida every year. Many cruisers planning to winter in the Bahamas or the Caribbean start their cruise by visiting Annapolis, Maryland during October before heading South. This coincides with the Annapolis In the Water Boat Show and allows them to equip their boat with the latest and greatest gadgets. Foreign cruisers usually sail the US east coast from Spring to Autumn, after crossing the Atlantic and spending the Winter in the Bahamas or Caribbean. 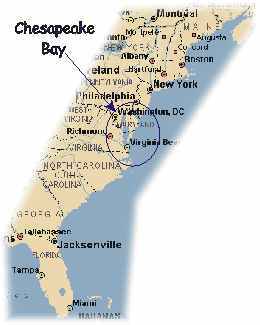 Many travel up the Chesapeake Bay to the Potomac River and Washington, DC and then further north up the Chesapeake to Annapolis and the Eastern shore anchorages of Maryland. Others go beyond to Long Island Sound, Martha's Vineyard and Maine - countless anchorages beckon the cruiser along this coast. Check-In Ports - Foreign cruisers must check-in one of the following ports of entry along the east coast. Maryland - Baltimore (This is not feasible for most cruisers of the Chesapeake as you must not stop before reaching the port. We have not checked out or into the US by boat in several years and do not have those current procedures at this time.